The Courtyard by Marriott Waterbury Downtown rises 11 floors in the city's skyline. Remodeled through and through, our state of the art lobby greets guests and our unique GoBoard provides updates on things you need to know. Choose from spacious rooms all with refrigerators, and well-appointed suites with kitchenettes-- all furnished with luxurious mattresses and comfort bedding. All rooms have been newly remodeled. Need pampering? We are proud to introduce our partnership with Viso Bello Spa now located at the Courtyard Waterbury. Enjoy services such as body massages, waxing, skin care and nail care. 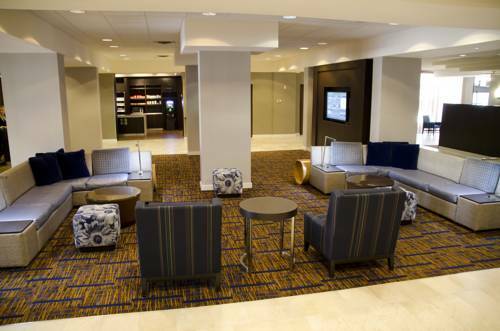 Stay connected with complimentary Wi-Fi and enjoy guest amenities such as our new indoor pool and fitness center. The Bistro is your food and beverage destination for three meals a day. We offer a full service bar and an on-site Starbucks serving throughout the day. More than 10,000 square feet of meeting and event space is available for business and special occasions.